Provide enjoyment of beautiful music for all who listen to us as well as those who ring. Educate people, entertain audiences, make music for all and promote the art of handbell ringing in the greater Modesto area. Challenge ourselves to grow musically, spiritually and professionally in a creative, caring and nurturing atmosphere. 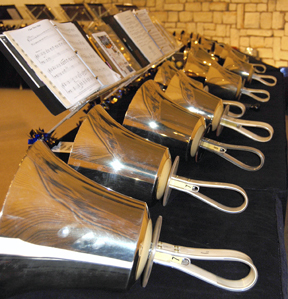 Opus is a group of musicians whose goal is to advance the art of handbell ringing. Unaffiliated with any church or organization Opus' repertoire includes a wide selection of sacred and secular music. Opus has performed in the greater Modesto area, including Tracy Festival of Trees and Bakersfield 12th Night Handbell Festival, private parties, memorial services, and weddings. With over 150 combined years of bell ringing experience, let Opus provide a Touch of Bronze! to your special event.